Are you sure we're supposed to be doing MATRIX training this season? "Blackie, You dance like you have 2 left feet!" "Duh, Buzz! I do!" The song changed, it's your turn to lead & my turn to dip! Thanks to everyone who played along by submitting captions and by voting. Special thanks to Linda Herdering of Mountain Maryland Kennels, LLC who submitted the photo. Are you sure this is how the dance is suppose to go? In doggie yoga this position is called "mushers viewpoint"
No, in this dance you dip me!! Hmmm, what did you have for lunch? What do you mean I stood on your foot! "Here's the way I see it.." "Yeah, me too." You put your left ear in, you pull your left ear out, you do the hokey-pokey, and you shake it all about! 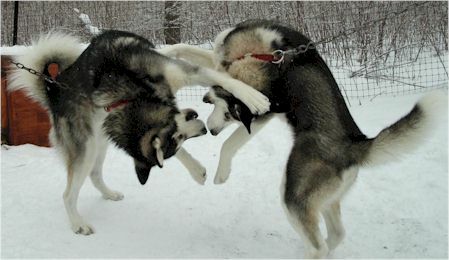 I told you that playing with our Musher's crazy glue was a bad idea! See! I told you the world looks different upside down. Mildred, this snow ballet would be SO much easier in the water, but I DO despise those pink bathing caps! Are you sure this is how you do the Macarena? No, you fool! It's supposed to be right foot on red! Yeah it sure is an upside down world!! And this is the stage in the Hokey-Pokey where you turn upside down... and that's what its all about, "YEAH" !!!!!!! See, I told you ,everything looks better upside down! Is so...is not...is so...is not...is so.. Hold still will you.....yeah there it is. That chicken bone is lodged right at the back! Do you REALLY think this will get us into the Olympics? I told you GEE not HAW !!! Now if Australia had snow the view would look something like this! "If you run with your head like this they won't put you on lead." "Okay,like this?" No, dammit Sparky! It's my turn to be lead dog! Your right, we still look alike this way. Hey Eddy! Even upside down.....you look just like me! I keep telling you..... this yoga position is with your head this way!!! Maybe if we fight, they'll let us make up!! Whud you eat? What's in there? Spit it out! I'm sorry mom but she took my cell phone. ....you put your right foot in, you put your right foot out, you put your right foot in and you shake it all about....you do the HOKEY POKEY and you turn yourself about....that's what its all about!!! Jake and Homer realized that sledding was just not going to make it into the Olympics in their lifetime, so they embarked on a plan to qualify as wrestlers. aaahh...lets see now....nope....nope....I don't see any cavities in there! hey your breath stinks OUT LOUD--woof, woof--brush your teeth!!!!?!!!! You're my best friend. I said: "I lead, YOU follow." Are you sure tantric yoga really works when breeding dogs?